Hernia is an abnormal protrusion of internal organs through an abnormal opening in the wall of the cavity.A combination of increased pressure inside the body with weakness in the wall is responsible for this condition.In this condition internal organs or parts of organs are protruded out forming a swelling which will increase the size with coughing and lifting weight,and while passing stool and urine.In lying down position the swelling goes inside except in strangulated and irreducible hernia. b) Acquired weakness due to injuries,wasting of muscles,suppurative lesions in the wall and presence of weak natural openings,obesity,lack of exercise,repeated pregnancy. Hernia can occure anywhere in the body.However there are some common sites for hernia.Due to the presence of hard bony covering chest wall is normally not affected.Hernia in the lower back is also rare due to spine and back muscles and tough ligaments and sheeths.The common site for hernia is abdominal wall.Compared to other parts the abdominal wall is weak due to the presence of some natural orifices.There are some areas wherein the abdominal muscles are weaker and thin and all these factors make a chance for herniation.The common sites for hernia are following. Here the abdominal contents protrude through the inguinal canal (passage in the lower abdominal wall just above the inguinal ligament.It is seen on either side).This type is common in males.Initially the swelling comes only while straining and goes back while lying down. Later the large portion of intestine may come out which may not go back easily. This type of hernia is more in females.Here the abdominal contents pass through the femoral canal which is seen just below the junction between the thigh and lower abdominal wall(Inside the femoral triangle).The contents pass downwards and comes out through saphenous opening in the thigh and forms a swelling under the skin. This is common in children.The umbilicus is the weaker part of the abdomen.The contents of the abdomen may protrude as a bulb like swelling while crying and defecating. These hernias are seen in operated sites. Due to improper suturing or sepsis the operated site becomes weak resulting in hernia. Here the hearniation occures in the epigastrium. It is a rare type. Here the hernia appear in the lumbar area on either side of the lumbar spine(in the lumbar triangle).This is also a rare type. If the hernial orifice is narrow the abdominal contents may not go back easily, and later the blood flow to the herniated tissues may be blocked due to constricition.This can cause death of protruded intestine. This occures when the whole portion of the intestine is protruded in to the hernial sac. The narrow hernial orifice will block the passage of bowels. If there is strangulation with death of a portion of intestine there will be spread of infection to the abdomen resulting in peritonitis. Special types of hernia belts are available for each type of heania.This will prevent the protrusion and will reduce pain. 2) Constipation,recurrent cough,urinary obstruction ect should be treated. 3) Fat reduction will increase the strength of abdominal wall. If no relief by the above steps consult a general surgeon for surgical management. 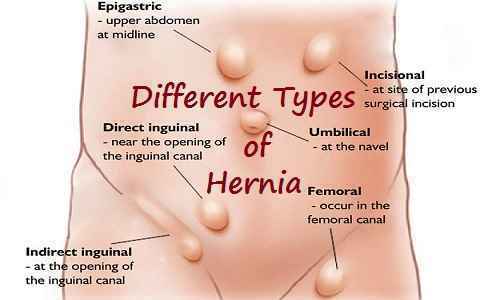 The following operations are done depending up on the type and nature of hernia. 1) Hertniotomy : In this operation the contents of hernial sac is pushed in to the abdomen and neck of the sac is ligated with transfixion ligature and the sac is cut off. 2) Herniorrhaphy: Here along with herniotomy the posterior wall is repaired. 3) Hernioplasty: This operation is done if herniotomy is not possible due to wide neck of the sac.Here the repair is done with the healp of non absorbable materials like tantalum gauze,polypropylene mesh or stainless steel mesh.